Last Sunday while I was in downtown Lafayette I made a couple of photos of the courthouse. It is going through a little construction right now, and normally I would not make a photo of it. I am not part of the county historical society so why would I want a photo of the courthouse with scaffolding up? When I saw it I thought of a black and white photo that would look kind of cool. The end result is what you see above. Also, when I was in school at Purdue the courthouse was under construction. It just so happened to be while I was in an OSHA class. The local paper ran a photo of the construction that actually showed a couple of violations occurring. 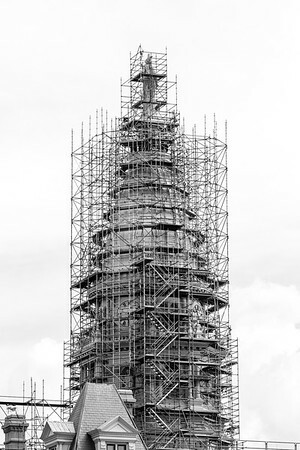 For some reason that story always stuck with me, and now once again the scaffolding is up. Soon the courthouse will be back to normal, but for now the Lafayette skyline looks a little different. Last week was a fun week to make some photos. You can see some of my favorite photos from the week here on my Exposure post. If you read this blog regularly then you know the drill. If you don’t then I will say that each week I choose a few of my favorite photos from the prior week to aggregate into one Exposure post. During a slow week it gives me something to go out and shoot for. It has sparked some creativity during downtimes, and that is what it is all about.